In a few days, Jessie and I are going to San Francisco! While I’d like to pretend I know exactly what I’m doing and where we’re going, I don’t. My navigational experiences in SF have all been by pure luck as I mapped out exactly where I wanted to go before I left (who needs GPS?) and made wishes on all my lucky stars that morning so I wouldn’t end up stranded in the tenderloin around scary heroin addicts or cult-leader hippies. I’ve always wanted (well, in my fantasy dream-world) to roam uncharted through a city I barely knew, picking up random conversations from passersby and finding unique hole-in-the-wall shops and cafes where I could people-watch from a cozy corner booth . One time, I went to SF by myself!! and it was quite the adventure. I had this fantasy dream-world scenario of being all cozy in a cafe, but instead I ate ice cream while I watched the meter by my car tick away in Little Mexico and ate a slice of pizza on Haight while the lady-worker stared at me. It was less on the cozy, more on the weird. But that’s okay. Plus, have you ever been lost in your own city, much less a strange one hours and hours away? God, whenever I find myself on a weird street in Sacramento, I have a mild panic attack. I can’t imagine if I ventured off-course alone in San Francisco. Just thinking about it makes me want to curl up with a jar of caramel sauce in my bed to replenish my levels of comfort and safety. But this time I’ll have Jessie with me and he’s pretty good at warding off scary things. Also, have you noticed guys don’t like asking people for directions? That obviously means they know where they’re going at all times, so I’m pretty confident I can’t die with Jessie around since he knows exactly what he’s doing and where he’s going. He’s like a GPS, a guardian angel, a ninja-fighter and a sweet boyfriend all in one! And I have a feeling he’ll probably have to whip out his extreme ninja moves once we get into Betsey Johnson, ’cause the emotional and physical grip I’ll have on those party dresses will be a psycho one. Going to the city with Jessie reminds me of my birthday last year when he and I stayed in a hostel for the weekend. But the hostel (Green Tortoise, if you’re interested) was clean and fun and interesting. And Jessie and I had a blast exploring the city and eating some seriously good food and having a wonderful time altogether, so whenever we go back, I always think of all the laughs, the amazing pan-fried cornbread with jalapeno jelly at Dottie’s and the (yes, weird) live music at the hostel and the great sights and sounds of the city. Also, we’re not zombies, just so you know. Since last time we ventured for my birthday and this time we’re venturing for a half Christmas/half birthday adventure, I figured I’d help celebrate the birthday mood with some car snacks to get us sugared up and ready to take on the city, one sprinkle at a time. 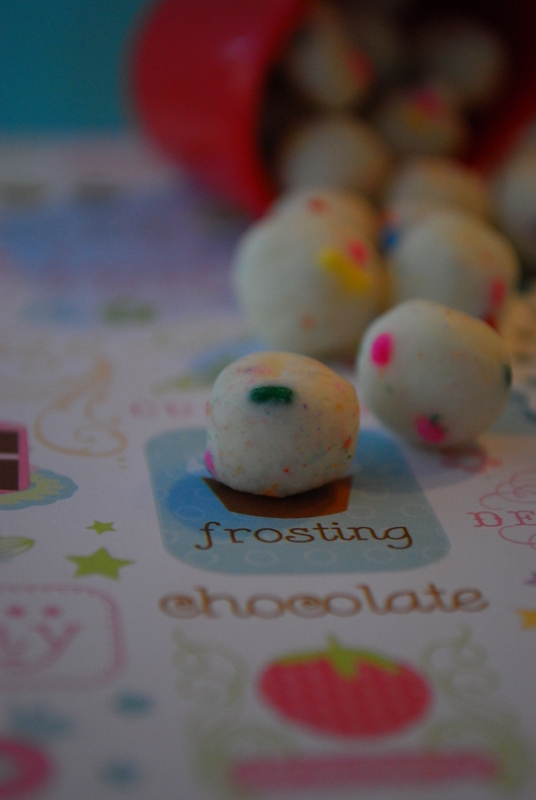 Alas, I made Funfetti Fudge. And it’s seriously addictive and delicious and incredibly rich and sweet, but you’ll need the sugar and sprinkles because it’s good for you. I got this incredible recipe from Victoria from The Pursuit of Hippieness and had to make it. 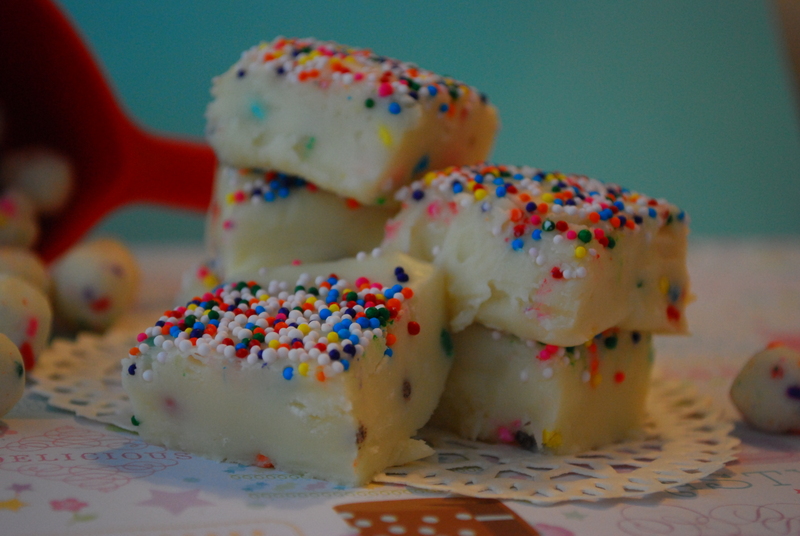 It is similar to my Birthday Cake Fudge, but I think this one is even richer and has more of a Funfetti flavor, whereas the birthday cake fudge has a regular-cake flavor. Am I making sense? Blame it on the sprinkles; I’m on a sugar high. 1. Line a 9×9″ baking pan with foil, allowing the sides of the foil to extend over the sides of the pan. Very lightly mist it with cooking spray and set it aside. 2. Meanwhile, in a microwave-safe bowl, microwave the white chocolate chips and the condensed milk together for 2-3 minutes, stirring well after each minute and keeping a close eye on it so the white chocolate & milk mixture does not burn. Once the mixture is completely melted and smooth, quickly add the vanilla extract to the milk mixture, stirring until blended. Add in the cup of rainbow jimmies (I used jimmies here) and stir them lightly as the longer you stir, the fudge may turn a muddy color from the sprinkle dye. 3. Pour the sprinkled fudge into your prepared pan and smooth it into an even layer. Sprinkle the top with the remaining sprinkles (here I used non-pareils, my favorite) and allow the fudge to harden and set in the fridge for about 2-3 hours. The longer it sits, the firmer it will get and be easier to cut and serve. Store this airtight. 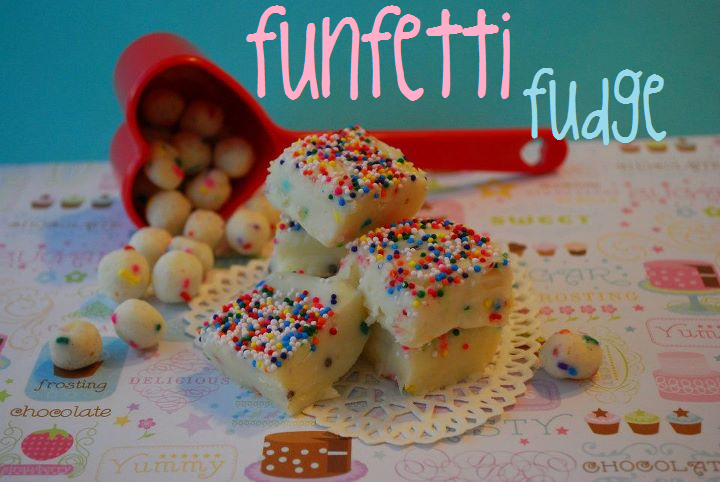 I firmly believe that if funfetti cake could taste like fudge, this would totally be it. I am quite positive there’s a possibility I will be in a sugar-induced coma for the next few days but as long as I have my sprinkly fudge I really don’t care. Join me in my sugar coma? Sooo jeal that you’re going to San Fran, I love it there so much! are you going to be checking out loads of bakeries? I made a whole long list of them for my sisters to check out when they were there in the summer and they were pretty rubbish and only managed to check out one! 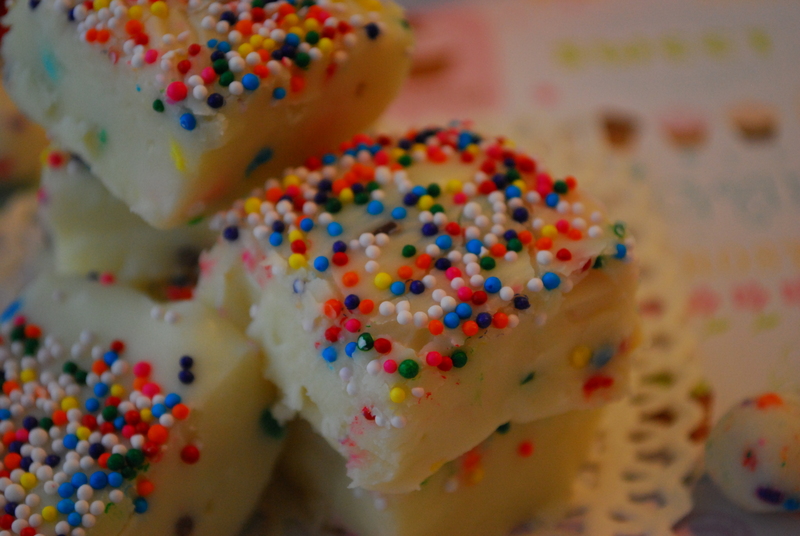 Your fudge looks delish…I could really be doing with some right now to get me through studying for my exams – boooring! Have a great time in ‘The City’ – hope you’ll post some pics! Hi Gem! I love stockings–it’s amazing how much my parents manage to cram into one large, crocheted sock each year. And I toooootally was super lame and forgot to research some bakeries to check out (like Miette!) before I left 🙁 so once we had left did I realize I’d meant to look at Miette. However, I did make it to Betsey Johnson (I do every time I’m there!) and Jessie and I had a nice, relaxing day trip which was full of picture-taking and yummy food. If you’ve ever seen Food Network’s Diners, Drive-ins and Dives, we did go to a place featured there–Tommy’s Joynt–and it was delish! I hope one day you can make it out there again! So glad you love the fudge 🙂 Don’t sprinkles make everything better?! As a New Yorker I have to pledge my allegiance to my own “the city”, though I LOVED SF both times I’ve visited… it’s right up my hippie alley! Never been to NYC but am hoping I can visit sometime! It sounds so incredible. Have a great day! xo. worst recipe ever. tasted nothing like the birthday cake fudge that the candy stores sell; definately was missing something. Sorry you didn’t like this recipe, Asa!